Listening to an episode of The Hustle podcast last week got me thinking about a concept I've long considered: albums with songs that carry the name of an album without actually being a "title track" in the traditional sense. I wouldn't be surprised, for example, if people believe that Pink Floyd wrote a song called "The Dark Side of the Moon" but it's actually called "Brain Damage" instead. It would be hard to confuse The Roots' song "You Got Me" with any other title, but the album name Things Fall Apart is a central lyric within the rap of that single. What triggered my memory was a deeper album cut from Spin Doctors, "Jimmy Olsen's Blues" carrying the lyric of the album title, Pocket Full of Kryptonite. 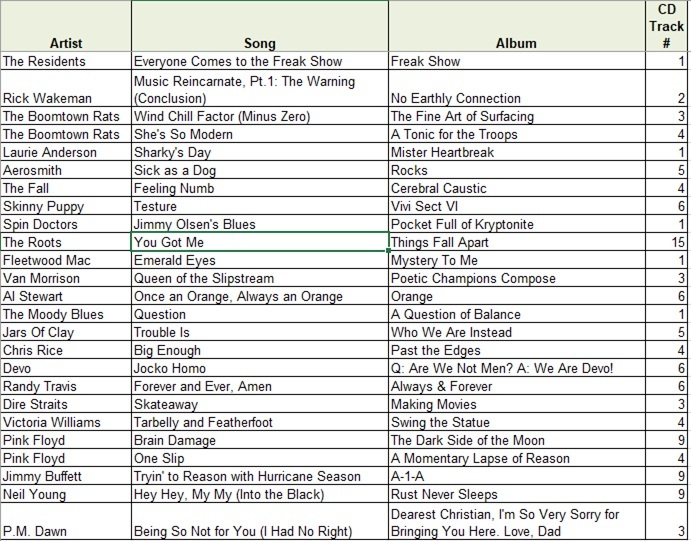 So, some of the 25 songs on the playlist I created as a starting point are obvious. Some, less so. I'm sure there are more. For now, here is my initial list of songs that function within their albums as The DeFacto Title Track.